We are nearly all moved in, and unpacked. Everything will probably move several times before we find a "home"for it but at least all the stuff is out of the boxes. Both Kevin and I found that process to be very overwhelming so i'm happy to be moving on. I've taken some iPhone shots of the current house. We have big plans and I wanted to share what's coming up. I currently don't know when the best time to take pictures of each room is. Every room has completely different light so I will try to do better in the future. I really wanted to change the doors out for Glass and Steel ones like these Portella ones. Unfortunately they are very expensive. To be honest I would probably swallow the cost I love them that much but they are manufactured in the States and shipping and duties would kill me. I've contacted a local Ironworks company hoping that I can somehow get these in Canada. Cross your fingers for me! I want to change the tile out with either a slate or a mosaic pattern of some type. If I do secure these doors having a really pretty intricate tile will look pretty darn sharp looking in. I also love the simplicity of a large format slate like the one in the photo above so don't be surprised if that's what I end up going with. Although the stairs are carpeted they have hardwood underneath. The plan is to strip them, and refinish them in a light oak finish. Then add a stair runner for safety. I'm loving the simplicity of iron handrails and I'm currently looking for a vender to change these out. 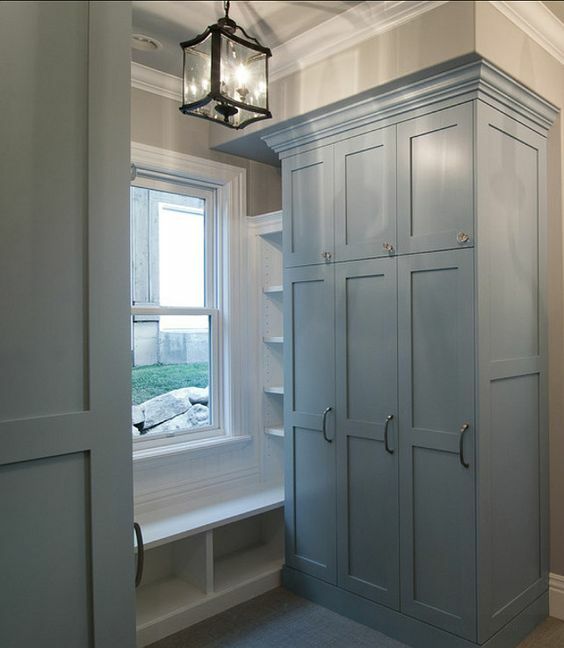 I'm not loving the glass closet doors, what do you think of something a bit more dramatic like the pic below? Does anyone know the difference between a Living room and a Family room? Is it a hold over from when people had a more formal living space? We are calling this room the Living room. My biggest fear with having two seperate seating areas was that one would go unused. This one is not visible from the Kitchen which would deter us from using it. My trick for ensuring we use the space is drumroll please!!! MAKE IT A TV ROOM. I know, I know that's not exciting enough to use caps, but I really think it will work so I'm excited. We are going to put a large built-in and probably a 72" television. This will be our movie night, game night location. We are putting our existing sectional in this room. I'll be honest, I probably would have preferred a regular sofa and chairs for this space but i'm going to make this one work. Studio McGee's TV stand is on point! Kitchen, Yes let's talk about the kitchen. Well it has orange stained slated doors, light green countertops and no backsplash. Some of the doors are coming off and there is a oddly placed bulkhead. We aren't actually sure what we are going to do here. There are a few ideas we are kicking around. I would love to hear what your thoughts are. Well hello there Lauren, what a nice kitchen you have there. 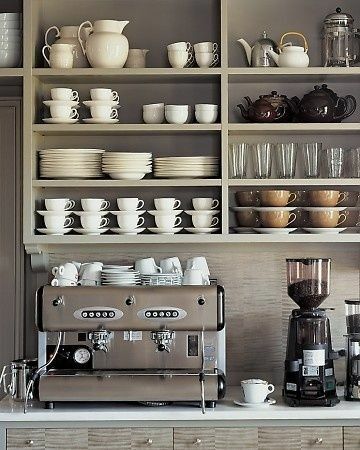 This is the very first inspiration photo I pinned for our new kitchen. I love how light and airy it is. Open and fresh. Seriously kitchen goals here. The only problem I have is I have a love affair with symmetry and this is far from symmetrical. I think a big appeal of the open shelving is how long it is. Seems to add an extra layer of freshness. This is definitely a contender. 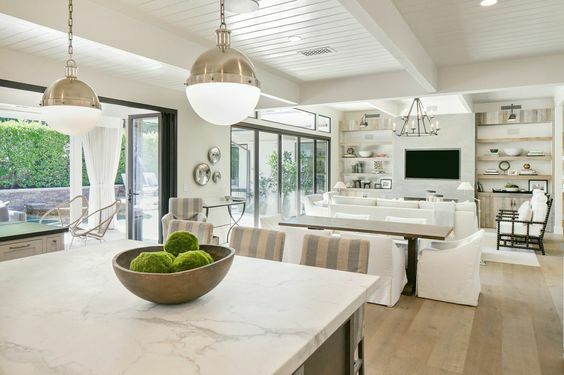 This GORGEOUS kitchen. It is a bit too traditional for me but the layout is what i'm looking at here. The shelves that go all the way from the counter to ceiling. I am in love with this kitchen. It's not as open and airy as the Lauren Conrad one and a big downfall for this is we would lose a ton of counterspace. Currently I'm leaning to option 1 but I switch back and forth daily so who knows what we will end up with. This is one of those room that's hard to get a picture of you aren't missing much. If you look at the existing kitchen picture you'll see a doorway. That is located on the wall to the right that is out of shot in this pic. Here's the thing, we don't need or want a formal dining room. Soooo drumroll please..... ..... .... we are transforming it into a PANTRY/MUDROOM! The picture window will be replaced by patio doors for access onto the deck we are going to build. We will split the space down the middle and have the pantry on one side and mudroom on the other. We are even trying to fit in a dog/boot wash. I think this will end up being my favourite space. We aren't exactly sure what we are going to do with this area. I'm nearly positive we are going to paint the fireplace white. I'm hoping to replace the stone with soapstone or slate. 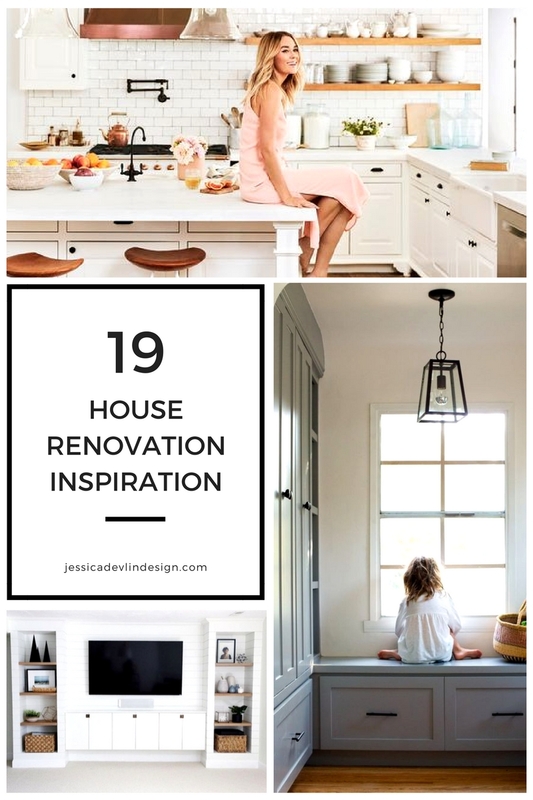 Paint the window frames black and change out the floor to a light oak. I'm thinking some nice white linen curtains and neutral rugs would warm up the space. That's it for now! What do you think, are we off to a good start. I'm so excited to get started we just need to decide where to start first!